We started our day a bit later than normal today because we (okay, mostly me) were organizing/editing/posting pictures from the trip thus far. It didn’t matter too much because today is the first day we realized how CLOSE we are to everything in this apartment! 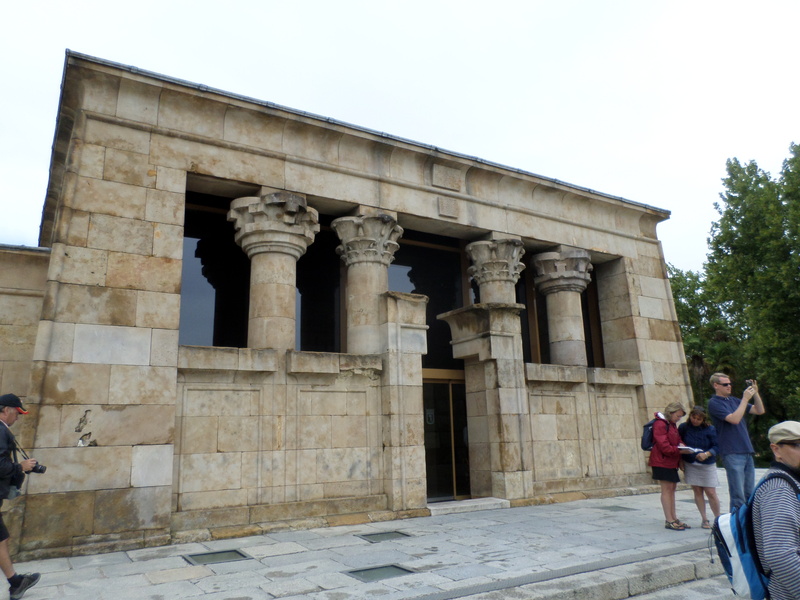 We started by taking a short walk (less than ten minutes) to reach the Templo de Debod. It’s not a huge building, but it’s totally worth checking out. 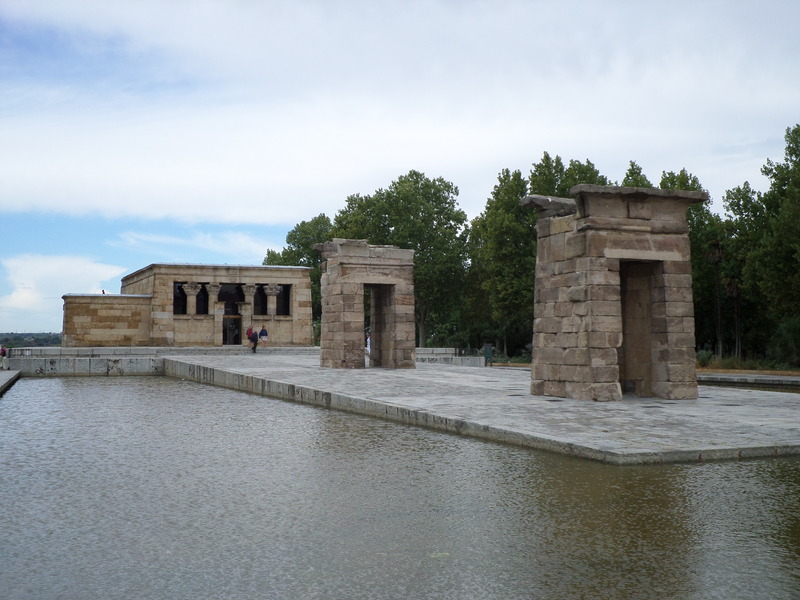 It’s a true Egyptian temple, built around 200 BC and shipped over and rebuilt in Spain in the late 1960s (a gift from Egypt). It’s cool (and free!) to see and there’s a cool fountain and some great views to take in behind it. If you visit, be careful of the wind. The temple is set up a little ways, so it can get extra windy there! 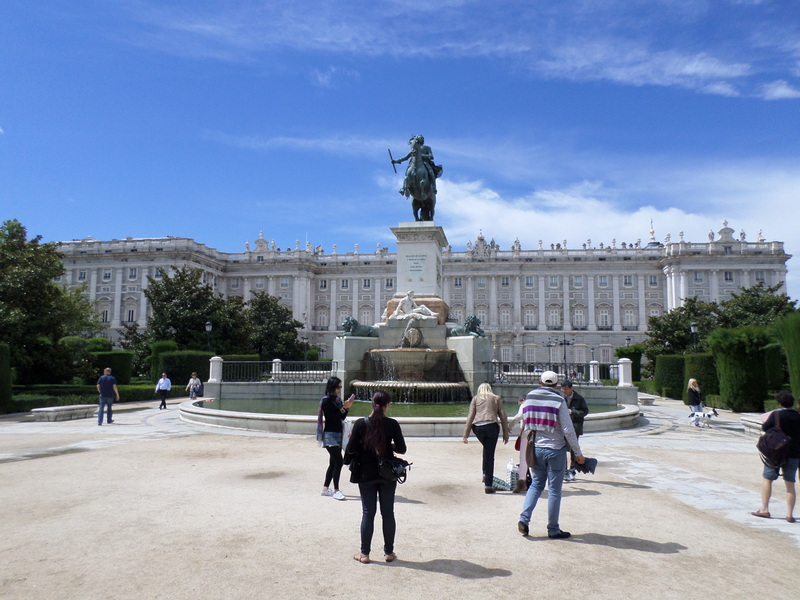 After a quick stop in nearby Plaza de España, we walked another few minutes to reach the Palacio Real de Madrid (Royal Palace of Madrid). If you like castles/palaces (heck, even if you don’t generally like them), this is one you should definitely see! Although it’s not actually home to the Spanish royal family, it’s an amazing building, with nearly 1.5 million square feet of floor space and over 3,400 rooms. That’s a lot of house! Sadly, you aren’t allowed to take pictures inside the palace, but there are some great views outside that you can capture. And the memories you can make by walking through it are definitely worth the entry price (€10 as of Sep 2013). This is the only attraction we paid to get into (aside from the botanical garden), so remember what I said in my last post – you can see and experience a lot in a city without spending a ton of money! 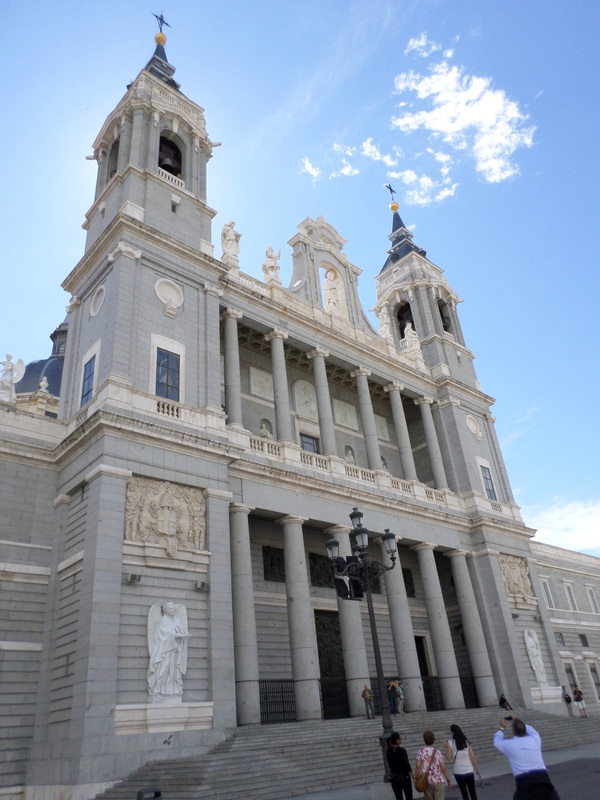 We walked about 100 feet from the palace to the Catedral de la Almudena. The building wasn’t actually finished until 1993, which is interesting because it didn’t feel that new to me. It’s a huge building and has very interesting architecture, so I recommend visiting, especially if you’re already at the palace anyway. I wanted to visit the crypt as well, but it was closed, so try to coordinate your visit around a time when it’s open. Scott had gotten some recommendations on places to visit, one of which was the Mercado de San Miguel. It’s an indoor market with a number of different food vendors inside – amazing stuff! It’s a great place to try lots of different things, including tapas, sweet treats, baked goods, and more. Definitely stop at this one and be sure you’re hungry when you do! 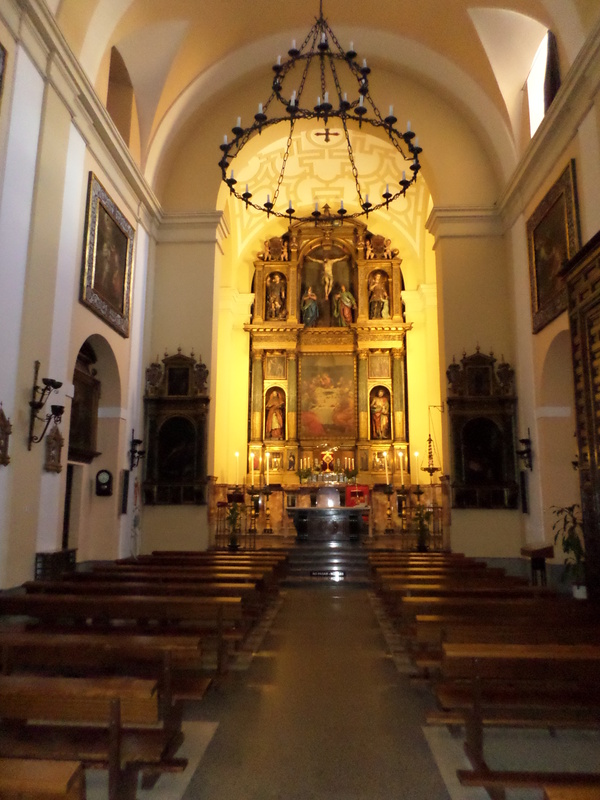 Ironically, our stop at San Miguel happened while we were on our way to get a very specific kind of food – cookies baked by a local group of nuns from the Corpus Christi church. It was a bit of an adventure because the cookie-selling times are limited and the church is located off a quiet plaza, but we eventually found our way there. 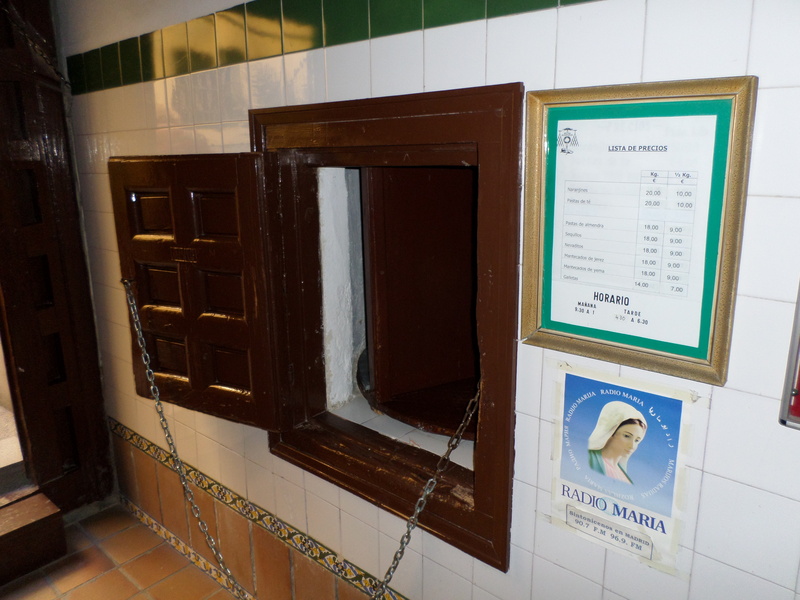 Interestingly, you never see the nuns – you just talk with them through the rotating window (see photo below). They make different cookies on different days, so they tell you what they have available that day (we got a sort of lemon shortbread – very good!). 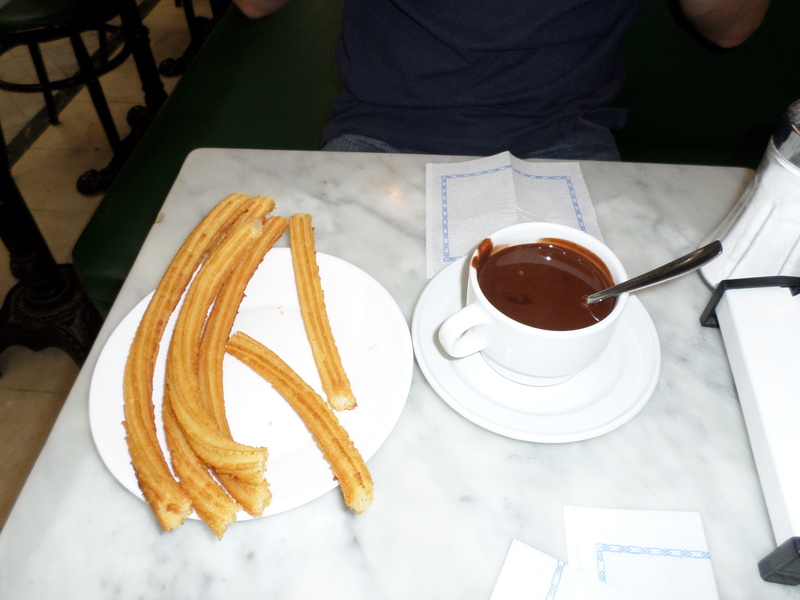 Since we were clearly enjoying food today, we wrapped the first part of the day up by having chocolate and churros, which is a must-do when you’re in Spain. Remember that this isn’t hot chocolate though – it’s a thicker chocolate sauce you dip the churros in. You can find chocolate with churros in many places, but Choclatería San Ginés is a great choice (and it’s open 24 hours!). You didn’t think I forgot about the Reina Sofia, did you? Don’t worry – we went! Like the Prado, the Reina has free admission for a couple of hours each night, so we took advantage of that. I wanted to go specifically to see Guernica, so we saw that and I was happy. 🙂 We did a bit more wandering through the museum before heading home for the evening. Exterior of the Templo de Debod. A closer shot of the temple. 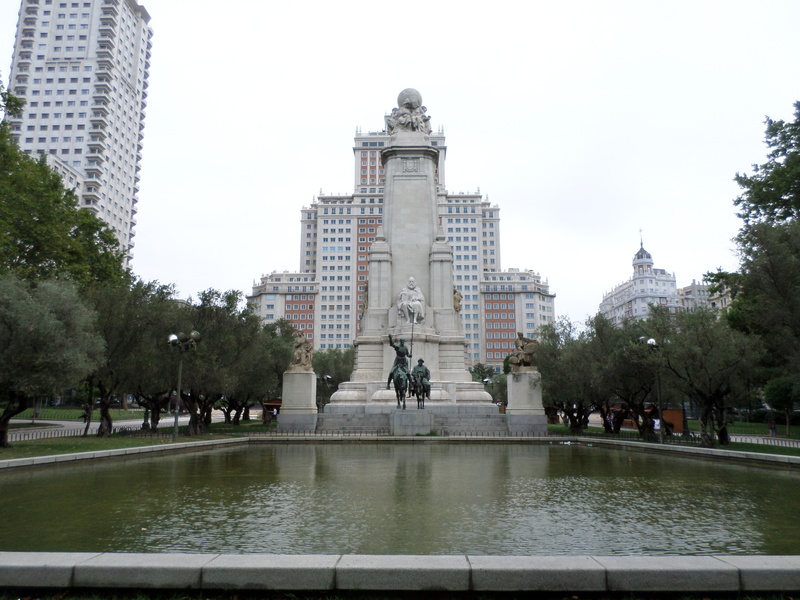 The Cervantes Monument in the Plaza de España. 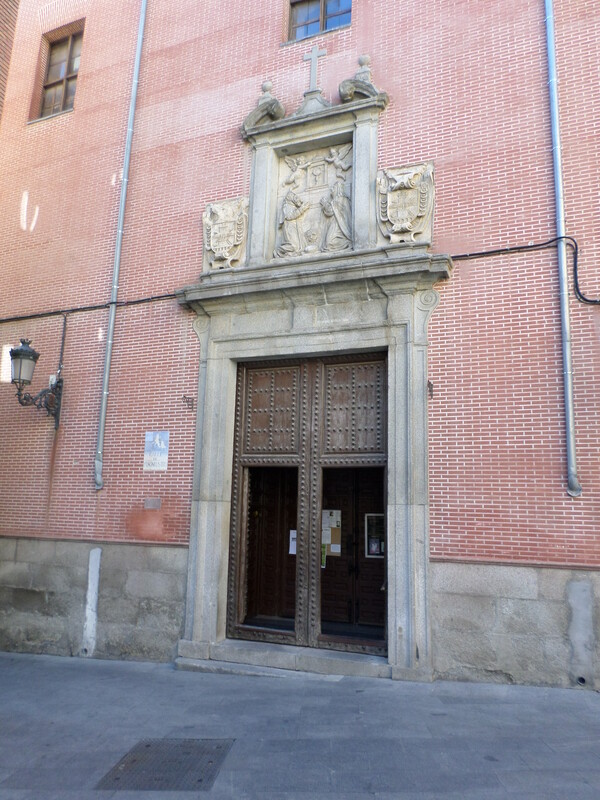 The front exterior of the Palacio Real. The courtyard of the Palacio Real. 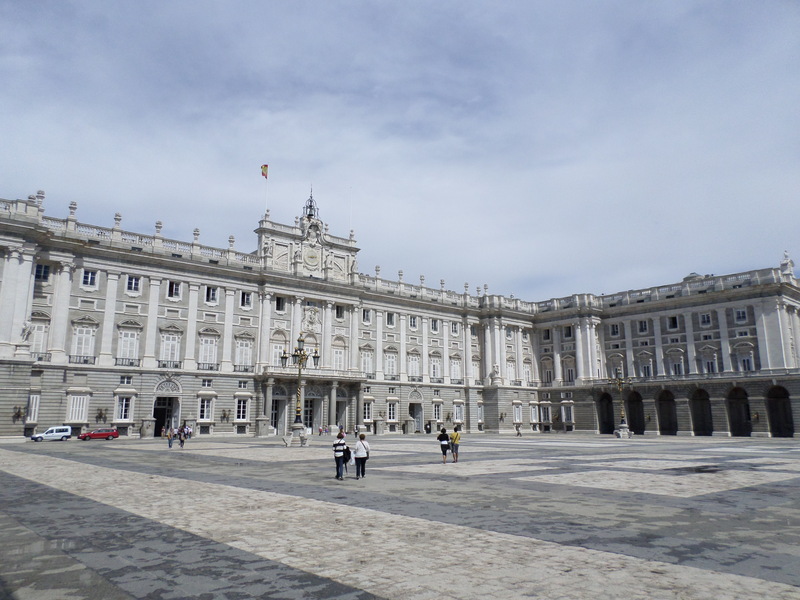 Panorama of the area around the courtyard of the Palacio Real. Exterior of the Catedral de la Almudena, across from the Palacio Real. 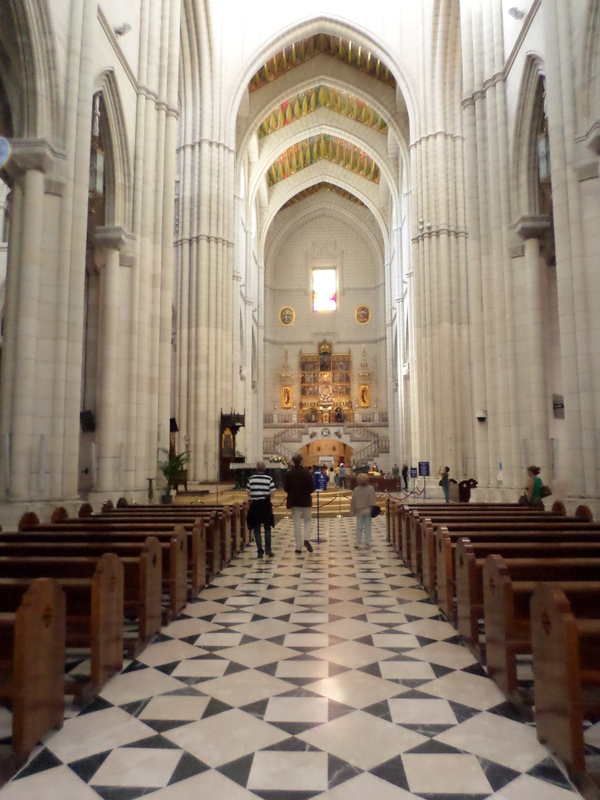 Looking towards the main altar of the Catedral de la Almudena. Churros and chocolate – mmmmm. The nondescript exterior of Corpus Christi. A shot of the altar at Corpus Christi. The “cookie window” at Corpus Christi. 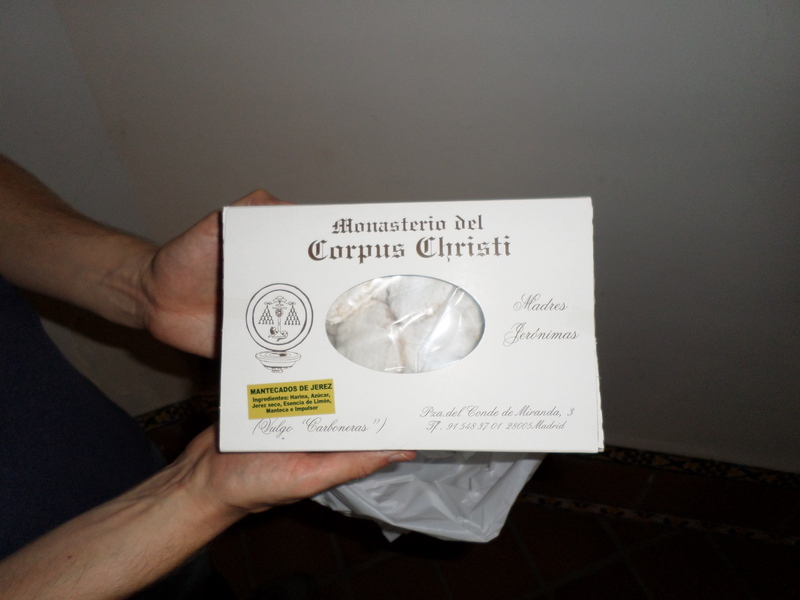 Our box of cookies from the monjas (nuns)! 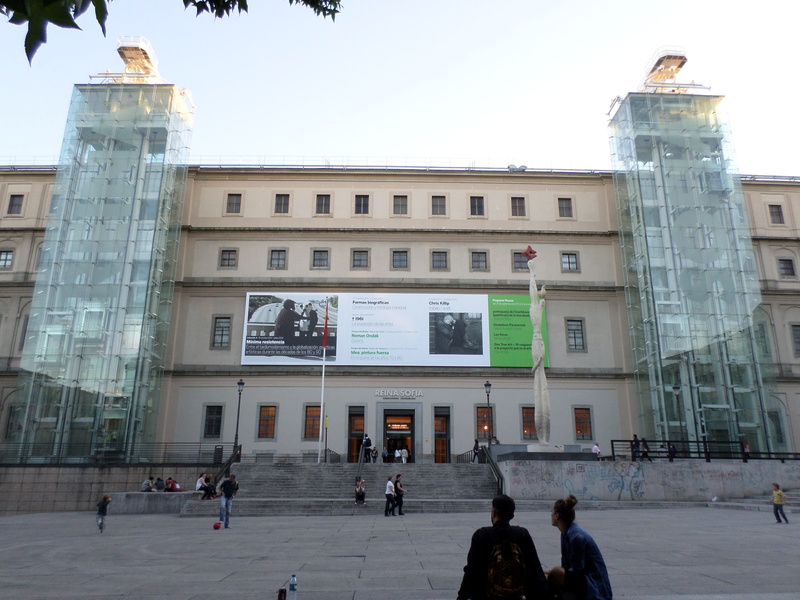 The Reina Sofia. Wish I could have taken a picture of Guernica! Tomorrow, we’ll be taking the first of our pre-planned day trips on this vacation. This first one is to Toledo – really looking forward to it! I booked it (and our other trips) through Viator, which I’ve used for several day trips in the past and have always had great luck with. We have to get up a little early to be at the meeting point by 9a, but I think it’s going to be a cool experience. How did you find all of these great apartments you are staying in? Any tips for picking the “winning” locations from the “loser” ones? A palace with 3400 rooms?? Does that seem obnoxious to anyone else? Or just me? 🙂 I can only imagine what walking through the place was like…Memories, indeed. We found all of our apartments through airbnb.com – it worked great for us! The key to finding the right one is to do good research. I seem to say that a lot, don’t I? 🙂 But it’s true! Figure out what you want to see in a city and then research apartments to find the one you like the most that’s the best deal (if money is an issue) and book it! Two things to call out though – don’t forget to think about availability of public transit when you’re researching apartments. An apartment that’s further out, but close to public transport (like our Amsterdam apartment) can still be totally viable. Also, be sure to read the reviews for the apartments so you know how many other people have stayed there and what they’ve said. Those can be invaluable and can also provide useful tips about both the apartment and the area you’re staying in. As for the nuns, I don’t think they’re cloistered because we did see one unlocking the church doors. I think it’s probably just easier (and likely safer) to sell their treats through the cookie window.